Ikea is the the global leader in the furniture market, and the United States is no exception. The invasion began when the Swedish furniture-selling powerhouse landed on American soil in 1985. Since then Ikea has become the top-ranked specialty furniture store in the country. In 2013, the Swedish retailer’s sales amounted to about $2.7 billion in the U.S., up from $2.5 billion in 2012. The American company Williams-Sonoma took second place with sales of approximately $2.2 billion in 2013. The year before, Williams-Sonoma generated about $1.9 billion in U.S. sales. Mattress Firm ranked third among the leading furniture stores with $1.4 billion in 2013 and $1.1 billion in 2012. Pier 1 Imports generated about $1.2 billion in sales in 2013, while La-Z-Boy Furniture Galleries saw a bit over $1 billion. The top 100 furniture stores generated over 65 percent of the total sales in the U.S. in 2011, while the sales of all other furniture stores amounted to 33 percent. 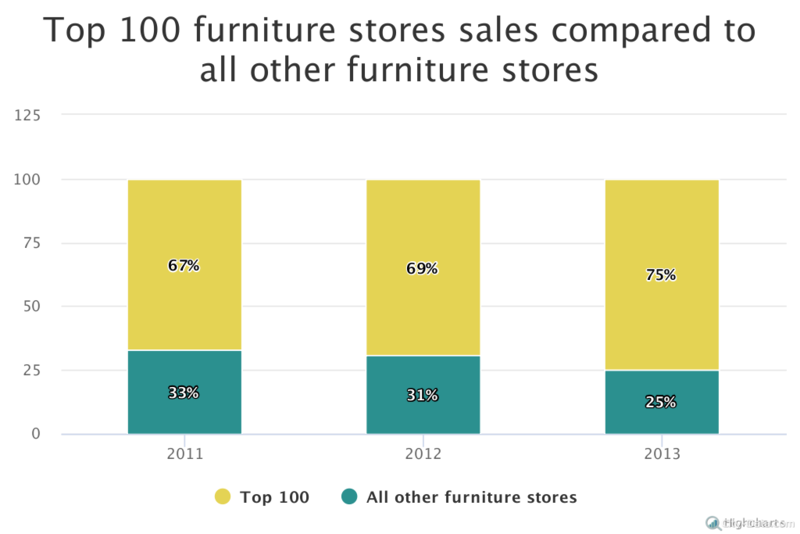 In 2012, the top 100 stores took an even larger share — 69 percent, compared to 31 percent for all other furniture stores. The top 100 stores saw their peak in 2013 when they received 75 percent of all sales in the United States. 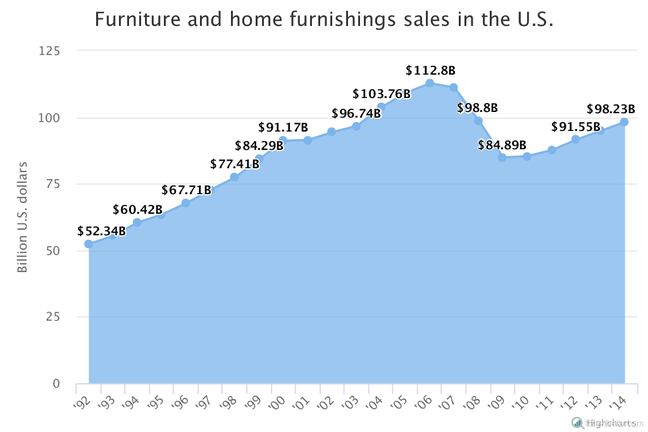 In the last couple of years, furniture and home furnishings store sales increased slightly. In 2009 the sales of furniture and home furnishings stores amounted to $84.89 billion. By 2010, the number increased to $85.41 billion. 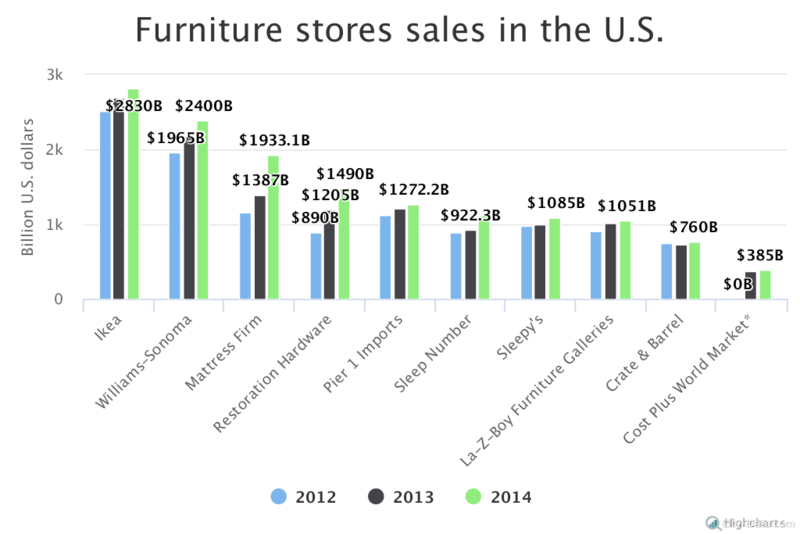 Furniture store sales approximated to $87.65 billion in 2011 and $91.55 billion in 2012. As seen in the graph, sales in 2013 amounted to $94.88 billion. In 2014 sales increased again, reaching $98.23 billion.